Exercise and Sport Sciences Reviews. 47(2):75-85, April 2019. Metabolic Adaptations to Short-term High-Intensity Interval Training: A Little Pain for a Lot of Gain? Gibala, Martin J.; McGee, Sean L.
Exercise and Sport Sciences Reviews. 36(2):58-63, April 2008. High-intensity interval training is a potent, time-efficient strategy to induce numerous metabolic adaptations usually associated with traditional endurance training. Exercise and Sport Sciences Reviews. 30(2):75-79, April 2002. Exercise and Sport Sciences Reviews. 47(2):86-90, April 2019. 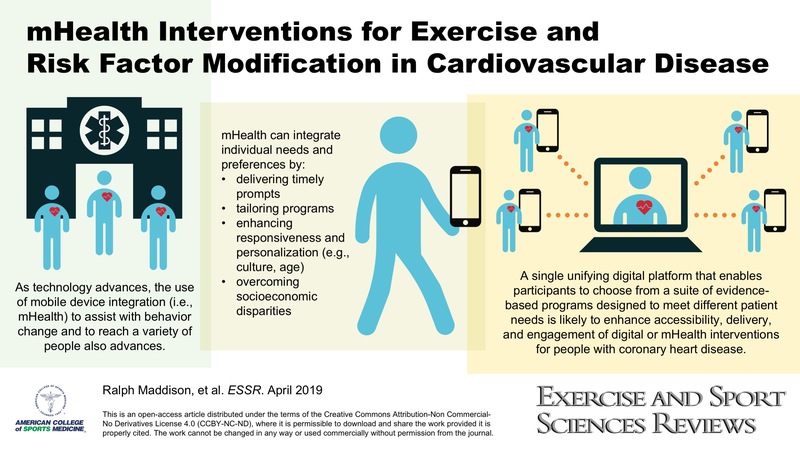 A digital platform hosting a suite of evidence-based interventions could promote exercise and lifestyle risk factor modification for the secondary prevention of heart disease. Ageberg, Eva; Roos, Ewa M.
Exercise and Sport Sciences Reviews. 43(1):14-22, January 2015. Current data suggest that the effect of neuromuscular exercise on pain and function is comparable to the effects seen from other forms of exercise. Exercise and Sport Sciences Reviews. 40(2):63-72, April 2012. Barefoot running offers insights on how evolution adapted humans to run. Coyle, E. F.; González-Alonso, J. Exercise and Sport Sciences Reviews. 29(2):88-92, April 2001. The Evolving Definition of "Sedentary"
Exercise and Sport Sciences Reviews. 36(4):173-178, October 2008. Most epidemiological studies assessing the health effects of being sedentary have not measured sedentary behaviors directly. Exercise and Sport Sciences Reviews. 41(1):3-10, January 2013. Muscle cramps have a neurogenic nature. Recent experimental findings providing new insights into cramp pathophysiology are presented. Exercise and Sport Sciences Reviews. 30(3):138-143, July 2002. Exercise and Sport Sciences Reviews. 47(1):3-14, January 2019. Hicks, Audrey L.; Kent-Braun, Jane; Ditor, David S.
Exercise and Sport Sciences Reviews. 29(3):109-112, July 2001. Coen, Paul M.; Carnero, Elvis A.; Goodpaster, Bret H.
Exercise and Sport Sciences Reviews. 46(4):262-270, October 2018. 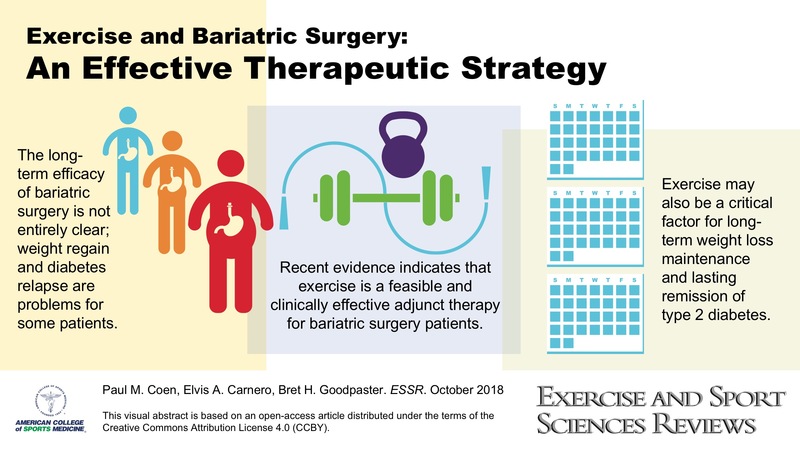 Exercise is a clinically effective adjunct therapy with the potential to promote long-term weight loss maintenance for bariatric surgery patients. Schlader, Zachary J.; Vargas, Nicole T.
Exercise and Sport Sciences Reviews. 47(2):116-126, April 2019. Thermal behavior decreases the requirement for autonomic thermoeffector activation. This suggests that autonomic thermoeffector activation contributes to thermal behavioral responses. Proske, Uwe; Allen, Trevor J. Exercise and Sport Sciences Reviews. 33(2):98-104, April 2005. Changes in properties of skeletal muscle are described that are the result of damage to muscle fibers from eccentric contractions. Exercise and Sport Sciences Reviews. 39(4):177-186, October 2011. A novel forced-exercise intervention is described, resulting in improved global motor function and cortical activation in patients with Parkinson's disease. Turner, Charles H.; Robling, Alexander G.
Exercise and Sport Sciences Reviews. 31(1):45-50, January 2003. Margolis, Lee M.; Rivas, Donato A. Exercise and Sport Sciences Reviews. 46(2):86-91, April 2018. Altered expression of microRNA to exercise is blunted with aging, contributing to diminished anabolic capacity of skeletal muscle and potentially sarcopenia. Exercise and Sport Sciences Reviews. 42(4):183-192, October 2014. We discuss the extent to which estrogen modulates skeletal muscle protein turnover at rest and after training. Exercise and Sport Sciences Reviews. 41(3):154-161, July 2013. Key findings from an ecological dynamics research program highlight benefits of small-sided and conditioned games for enhancing skill acquisition and decision making. Exercise and Sport Sciences Reviews. 44(2):81-88, April 2016. The timing of exercise in relation to the information to be remembered is critical to maximize the effects of acute cardiovascular exercise on memory. Exercise and Sport Sciences Reviews. 31(1):3-7, January 2003. Can Exercise Treat Eating Disorders? Hausenblas, Heather A.; Cook, Brian J.; Chittester, Nickles I. Exercise and Sport Sciences Reviews. 36(1):43-47, January 2008. Grange, Robert W.; Call, Jarrod A. Exercise and Sport Sciences Reviews. 35(1):12-17, January 2007. Studies are required to define a safe and effective exercise prescription for individuals with Duchenne muscular dystrophy. Exercise and Sport Sciences Reviews. 29(2):65-70, April 2001. Exercise and Sport Sciences Reviews. 29(1):26-31, January 2001. Exercise and Sport Sciences Reviews. 47(1):29-36, January 2019. The anabolic effect of exercise and dietary protein is greater in active youth than in adults. Goodwin, Peter C.; Morrissey, Matthew C.
Exercise and Sport Sciences Reviews. 31(2):85-90, April 2003. Exercise and Sport Sciences Reviews. 31(1):8-12, January 2003. Skeletal Muscle Fatigue and Decreased Efficiency: Two Sides of the Same Coin? Grassi, Bruno; Rossiter, Harry B.; Zoladz, Jerzy A. Exercise and Sport Sciences Reviews. 43(2):75-83, April 2015. During high-intensity submaximal exercise, muscle fatigue and a decreased efficiency of contractions are strictly intertwined and share several common mechanisms. Exercise and Sport Sciences Reviews. 38(2):68-75, April 2010. Changes in hemoglobin mass by 1g alter V?O2max by ~4mL·mn-1 due to changes in blood volume or hemoglobin concentration. Exercise and Sport Sciences Reviews. 31(4):159-160, October 2003. Exercise and Sport Sciences Reviews. 31(3):138-143, July 2003. Regular exercise provides meaningful, lasting benefits on the physiological and psychosocial sequelae in people with osteoarthritis. Exercise and Sport Sciences Reviews. 45(3):146-153, July 2017. The impact of dehydration on tissue blood flow and metabolism is dependent on the extent of the cardiovascular demand imposed by exercise. Exercise and Sport Sciences Reviews. 31(2):61-67, April 2003. Exercise and Sport Sciences Reviews. 46(2):129-136, April 2018. It was hypothesized that the scientific evidence supporting that “Live High-Train Low” improves sport-specific exercise performance is weak. Hagger, Martin S.; Chatzisarantis, Nikos L.D. Exercise and Sport Sciences Reviews. 42(2):62-69, April 2014. The Integrated Behavior Change Model is a comprehensive multitheory model that outlines the psychological factors and processes that determine physical activity. Epstein, Leonard H.; Roemmich, James N.
Exercise and Sport Sciences Reviews. 29(3):103-108, July 2001. Hunter, Sandra K.; Duchateau, Jacques; Enoka, Roger M.
Exercise and Sport Sciences Reviews. 32(2):44-49, April 2004. The study of task failure provides information about the functional significance of fatigue-related adjustments. Exercise and Sport Sciences Reviews. 33(3):120-126, July 2005. This review develops the hypothesis that physical activity may prevent stress-induced immunosuppression by increasing sympathetic nervous system constraint during stressor exposure. Exercise and Sport Sciences Reviews. 46(1):4, January 2018. High-Intensity Interval Training to Maximize Cardiac Benefits of Exercise Training? Wisløff, Ulrik; Ellingsen, Øyvind; Kemi, Ole J. Exercise and Sport Sciences Reviews. 37(3):139-146, July 2009. Health effects of exercise-induced cellular and molecular cardiovascular adaptation mechanisms are markedly larger in interval training at high relative intensity. Exercise and Sport Sciences Reviews. 35(3):135-140, July 2007. Authorities recommend that we avoid caffeine. Does caffeine use result in a fluid-electrolyte imbalance, hyperthemia, or heat intolerance? Exercise and Sport Sciences Reviews. 33(4):175-181, October 2005. To improve the predictive capacity of research examining environmental correlates of physical activity, behavior and context-specific constructs are required. Exercise and Sport Sciences Reviews. 44(2):71-80, April 2016. This article presents a conceptual model of key factors that characterize a socioculturally targeted approach to physical activity intervention design and delivery. Dempsey, F C.; Butler, F L.; Williams, F A. Exercise and Sport Sciences Reviews. 33(3):141-149, July 2005. The current literature does not support concerns which once promoted many to think about pregnancy as a period of confinement. Exercise and Sport Sciences Reviews. 33(4):195-200, October 2005. Biomechanical factors play a central role in the development of osteoarthritis by regulating joint physiology and pathology. Exercise and Sport Sciences Reviews. 46(1):18-25, January 2018. Sedentary behaviors can be associated with adiposity, but the field is complex. Results depend on the type of sedentary and other behaviors being assessed. Exercise and Sport Sciences Reviews. 44(1):2, January 2016. Guskiewicz, Kevin M.; Mihalik, Jason P.
Exercise and Sport Sciences Reviews. 39(1):4-11, January 2011. The biomechanical threshold for concussion may be more elusive than originally thought, and impact severity does not predict injury severity. MacArthur, Daniel G.; North, Kathryn N.
Exercise and Sport Sciences Reviews. 35(1):30-34, January 2007. A common variant of the ACTN3 gene, R577X, is associated with elite athlete status and human muscle performance. Exercise and Sport Sciences Reviews. 46(2):66-75, April 2018. The assessment of cardiorespiratory fitness among children and youth is an important and feasible measure for population health surveillance. Falla, Deborah; Hodges, Paul W.
Exercise and Sport Sciences Reviews. 45(2):105-115, April 2017. Individuals adapt differently to spinal pain, and exercise outcome can be optimized when tailored to each individual. Luttrell, Meredith J.; Halliwill, John R.
Exercise and Sport Sciences Reviews. 45(1):16-23, January 2017. Histamine is a molecular transducer of physical activity responses with broad-ranging effects in exercising skeletal muscle in humans. Hawley, John A.; Burke, Louise M.
Exercise and Sport Sciences Reviews. 38(4):152-160, October 2010. Exercise and Sport Sciences Reviews. 43(4):181-189, October 2015. Habitual aerobic exercise promotes brain health, which is mediated at least in part by improvement in cardiovascular function. Cerebrovascular Reserve: The Link Between Fitness and Cognitive Function? Exercise and Sport Sciences Reviews. 40(3):153-158, July 2012. Physical fitness is associated positively with cognitive functioning as we age, and this is mediated, at least in part, by cerebrovascular mechanisms. Exercise and Sport Sciences Reviews. 40(2):106-115, April 2012. This review discusses how the human central nervous system can control complex jumping movements task- and context-specifically. Why Do People Jump the Way They Do? Bobbert, Maarten F.; “Knoek van Soest, A. J. Exercise and Sport Sciences Reviews. 29(3):95-102, July 2001. Buckwalter, John B.; Clifford, Philip S.
Exercise and Sport Sciences Reviews. 29(4):159-163, October 2001. Exercise and Sport Sciences Reviews. 47(2):66-74, April 2019. Physical activity–induced improvements in vascular insulin sensitivity in the skeletal muscle and brain are likely related to the exercise hyperemic response. Exercise and Sport Sciences Reviews. 33(4):155-156, October 2005. Exercise and Sport Sciences Reviews. 45(2):87-95, April 2017. Joint loading may protect runners from knee osteoarthritis through the mechanisms of 1) low cumulative load and/or 2) conditioning cartilage to withstand frequent application of high joint stresses. Sleep Apnea: A New ‘Risk Factor’ for Cardiovascular Disease? Morgan, Barbara J.; Joyner, Michael J. Exercise and Sport Sciences Reviews. 30(4):145-146, October 2002. Burd, Nicholas A.; Gorissen, Stefan H.; van Loon, Luc J.C. Exercise and Sport Sciences Reviews. 41(3):169-173, July 2013. We provide evidence to suggest that maintenance of physical activity can reduce the anabolic resistance of muscle protein synthesis to protein intake with aging. Exercise and Sport Sciences Reviews. 43(1):57-64, January 2015. The article provides evidence that lifelong sprint-oriented training is equally beneficial for successful aging as endurance training is. Konopka, Adam R.; Harber, Matthew P.
Exercise and Sport Sciences Reviews. 42(2):53-61, April 2014. Although not commonly associated with gains in skeletal muscle mass, aerobic exercise stimulates muscle protein synthesis and skeletal muscle hypertrophy. Exercise and Sport Sciences Reviews. 29(1):32-36, January 2001. Exercise and Sport Sciences Reviews. 35(4):180-185, October 2007. Exercise and Sport Sciences Reviews. 44(1):4-11, January 2016. Combining metformin (as well as statins and antioxidants) with exercise may not add and even attenuate exercise-induced adaptations for glucose homeostasis. Caffeine: A Valuable Tool to Study Central Fatigue in Humans? Exercise and Sport Sciences Reviews. 32(4):143-147, October 2004. This review describes caffeine’s effects on human muscle activation and describes how the drug may be used to study central fatigue. Exercise and Sport Sciences Reviews. 33(4):157-162, October 2005. The turnover of glycogen in muscle generates lactate and provides ATP rapidly to satisfy the power needs of contraction. Exercise and Sport Sciences Reviews. 30(1):45-49, January 2002. Exercise and Sport Sciences Reviews. 31(4):182-187, October 2003. Aging changes in neuromusculoskeletal factors that impair lateral stability during protective stepping and other balance-correcting functions are related to the problem of falls in older people. Exercise and Sport Sciences Reviews. 30(1):8-14, January 2002. Coggan, Andrew R.; Peterson, Linda R.
Exercise and Sport Sciences Reviews. 46(4):254-261, October 2018. We review recent studies of the effects of dietary nitrate on human muscle contractile function and discuss possible underlying mechanisms. Open- or Closed-Kinetic Chain Exercises After Anterior Cruciate Ligament Reconstruction? Fleming, Braden C.; Oksendahl, Heidi; Beynnon, Bruce D.
Exercise and Sport Sciences Reviews. 33(3):134-140, July 2005. Current evidence suggests that open-kinetic chain exercises can be incorporated into the early phases of rehabilitation following anterior cruciate ligament reconstruction. The Future of Physical Activity Behavior Change Research: What Is Needed to Improve Translation of Research into Health Promotion Practice? Dzewaltowski, David A.; Estabrooks, Paul A.; Glasgow, Russell E.
Exercise and Sport Sciences Reviews. 32(2):57-63, April 2004. The RE-AIM framework provides a useful way of reporting external validity factors to facilitate the translation of research to practice. Exercise and Sport Sciences Reviews. 47(1):46-53, January 2019. This review will critique cell, rodent, and human models of mTOR regulation to discuss why mTOR trafficking may represent a novel and physiologically relevant model of regulation in skeletal muscle. Nigg, B. M.; Wakeling, J. M.
Exercise and Sport Sciences Reviews. 29(1):37-41, January 2001. Exercise and Sport Sciences Reviews. 41(1):19-25, January 2013. With increasing age, the risk for mobility decline increases. Genetic factors, aging processes and pathology, physiological impairments, and environmental factors contribute to the process. Exercise and Sport Sciences Reviews. 36(3):135-144, July 2008. This review examines the evidence as to whether dietary modification represents a potentially beneficial treatment intervention for asthmatic individuals with exercise-induced asthma. Sterzing, Thorsten; Hennig, Ewald M.
Exercise and Sport Sciences Reviews. 36(2):91-97, April 2008. Soccer shoes influence both the stance leg and the kicking leg and hence ball velocity when striking with the instep. Rhodes, Ryan E.; Nigg, Claudio R.
Exercise and Sport Sciences Reviews. 39(3):113-119, July 2011. This review details the advances of three prominent theories applied to understand physical activity, along with a framework for future theory testing. Exercise and Sport Sciences Reviews. 34(4):154-158, October 2006. Neural mechanisms contribute to the benefits achieved with acute muscle stretching and long-term stretch training. Exercise and Sport Sciences Reviews. 34(3):135-141, July 2006. Models are used to assess the effects of speed, musculotendon properties, and coordination on hamstring mechanics during sprinting, thereby providing insights into injury and rehabilitation mechanisms. Exercise and Sport Sciences Reviews. 47(2):108-115, April 2019. Skeletal muscle fiber splitting is proposed to be a physiological response to extreme loading and hypertrophy across species and is distinct from regeneration. Exercise and Sport Sciences Reviews. 31(3):144-148, July 2003. Exercise appears to have no suppressive effect on menstrual function beyond the impact of its energy cost on energy availability. Exercise and Sport Sciences Reviews. 37(4):179-187, October 2009. Cross-education of strength is greater after training the dominant limb, which suggests a connection between strength transfer and skill transfer. Donnelly, Joseph E.; Smith, Bryan K.
Exercise and Sport Sciences Reviews. 33(4):169-174, October 2005. Men appear to lose more weight than women in response to exercise, and this is likely caused by greater compensation for energy intake for women compared with men, and a diminished energy expenditure of exercise for women compared with men. Exercise and Sport Sciences Reviews. 33(2):63-68, April 2005. Skeletal muscle has a remarkable capacity for hypertrophy and regeneration following intense exercise due to resident stem cell populations. What Is the Role of Titin in Active Muscle? Exercise and Sport Sciences Reviews. 40(2):73-78, April 2012. This paper summarizes a novel hypothesis for activation- and force-dependent increases in titin stiffness and implications for understanding muscle contraction. Exercise and Sport Sciences Reviews. 32(4):129-134, October 2004. Endothelial dysfunction is an independent predictor of cardiovascular events and can be improved by exercise via increasing nitric oxide bioavailability. Exercise and Sport Sciences Reviews. 30(1):26-31, January 2002. Exercise and Sport Sciences Reviews. 34(2):83-88, April 2006. Extraversion and conscientiousness may be important endogenous influences on physical activity participation. Physical activity interventions may need to consider these factors for success. Exercise and Sport Sciences Reviews. 34(3):107-112, July 2006. Children's faster recovery from exercise is a direct consequence of their lower power output, and is also associated with age-related dimensional differences. Exercise and Sport Sciences Reviews. 45(1):24-33, January 2017. A single bout of eccentric exercise makes skeletal muscles more resistant to damage, and multiple mechanisms interact to give rise to this adaptation.